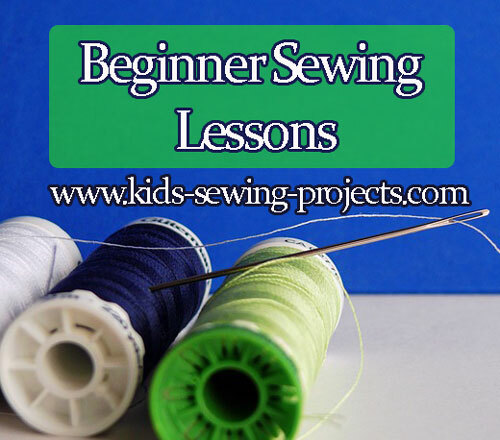 Pre-beginner sewing lessons are projects and activities that will help children 6-8 years old and up ( the age is just a beginning guideline) learn some basic skills, such as hand sewing. These kids sewing projects will start by using a needle and thread and learning how to tie a knot in the thread. Learning to sew by hand requires a lot of practice. This will also help them prepare for doing sewing projects on the sewing machine. You can do these lessons as often as you'd like. You can do one lesson a week in the order listed or once a day. It is really up to the interest of each child. These are the first steps to learning how to sew by hand. Don't expect a lot from your beginning sewer in the pre-beginner sewing lessons, it is just building basics and having fun, nothing more. Kids can start hand sewing on scrap material. Let them sew whenever they want to practice. 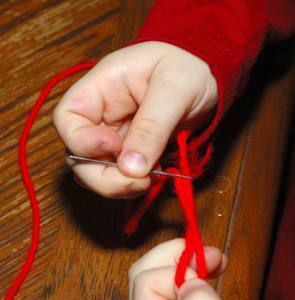 Show kids how to thread yarn onto a non sharp needle. You don't need to put a knot in the end of the thread. Thread the yarn through the holes holding the end so it doesn't slip out. Let kids practice making a design with the yarn. Their yarn might need re-threaded. That is okay, this will give them practice threading a needle. 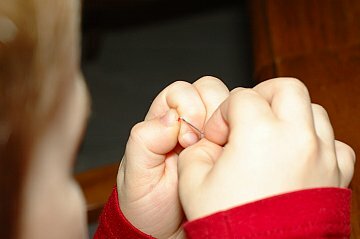 Just keep in mind it may take a lot of practice when learning to thread a needle, be patient and provide encouragement. 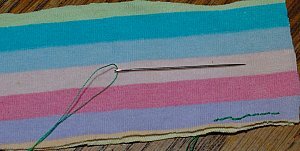 Now that kids have practiced with a larger non-sharp needle, let them practice threading a smaller hand sewing needle with thread. This is hard to get at first. It will sometimes take a lot of practice. ~If you need more helping learning how to thread your needle check out this help page. Another thing to teach in this lesson is about being careful with needles. They're sharp on the end and you need to be careful handling them. Learn to sew carefully so as not to poke yourself with the needle. They also need to be reminded not to leave them lying around. Always put the needle in a pin cushion when you're done so it doesn't get lost or stepped on. Cut a piece of thread, then pinch the thread together. Wet your finger first, this will help flatten the thread. Poke the thread through the hole in the needle. Pull the thread through and meet the ends together. **In the next lesson, we will tie the end. Threading the needle isn't the only basic step that takes practice. Teach kids to tie a knot in the end of the thread. Bring the thread ends together to meet at the end and tie a knot. This is even harder to do and takes lots of patience and practice, but I think it's good to start them early at least trying to do it. 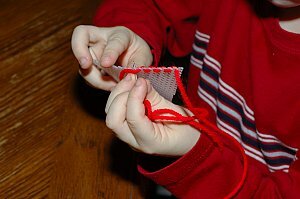 You may also want to have kids practice tying knots in larger yarn or rope and then move to tying knots in thread, after you've threaded your needle from the previous lesson. To tie a knot in your thread, wrap thread around your finger and poke needle up under threads, pull needle and thread all the way through. Slip the loops off your finger and pull knot tight. Another way to tie a knot in the end is to make a loop at the end of the thread. Poke the end of the thread through the loop and pull the knot tight. Tying a knot is something important to learn, as you will also use it for finishing your hand sewing when you are done. How to tie a knot sewing video. In this pre-beginner sewing lesson, you will practice making straight stitches on scrap material with your needle and thread. 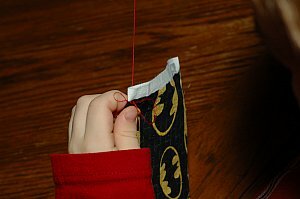 Check out this page for some basic hand sewing stitches. Poke your threaded needle through your layers of fabric. Pull your thread through the fabric until you reach the knotted end. Poke your needle back through the fabric and up again to make a stitch, keep your fabric laying flat. When you are close to the end of your thread you will need to make a knot and cut off the thread. Thread your needle again and tie the ends. Now begin where you left off. Continue hand sewing and making whatever size stitches they want or can do. Then work toward making smaller stitches and having them closer together and more even. 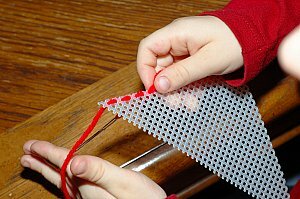 This lesson can take lots of practice and they probably won't get very small even stitches until they are older. Hand sewing takes some practice but it is a skill that will benefit kids through the years. Continue to practice on scrap material whenever your sewer would like to. Now you are ready for some hand sewing Felt Patterns! 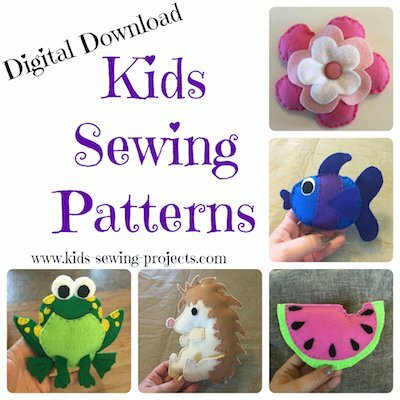 Once kids have had practice hand sewing they can start some basic hand sewing projects with these Pre-Beginner Sewing Projects. Don't forget to learn some Basic Hand Sewing Stitches. Do you have a Pre Beginner Sewing Lessons or Project to Share? Ready to move from the Pre beginner sewing lessons?